Jan Howell, who has been living at the Abbey for a year and a half-one year of that as an anagarika with eight precepts-became a sramanerika (novice nun) and a shiksamana (training nun). According to Vinaya (the monastic discipline established by the Buddha), novice nuns and training nuns are to be ordained by bhikshunis (fully ordained nuns). However, since the lineage of fully ordained nuns was never established in Tibet, the monks give the novice nun’s ordination, and full ordination for women is not yet possible for women in the Tibetan tradition (We’re working on that. Click here for more info.). Some Western nuns and Himalayan nuns who practice in the Tibetan tradition have gone to the Chinese, Vietnamese, and Korean communities to receive full ordination. In 1986, Ven. Chodron did this and became a bhikshuni. 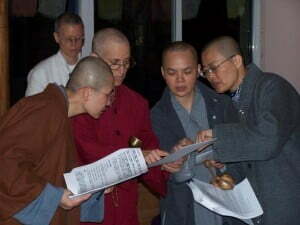 We invited three Chinese nuns to come to the Abbey so that a sangha of four bhikshunis could perform the ordination. Ven. Tzushin and Ven. Chanlu from Fayun Prajna Monastery in New Mexico and Ven. Tien Chang, a graduate student at the University of Washington, kindly accepted our invitation. They care deeply about the monastic sangha and want to help it take root at the Abbey and in the USA. In the three days that we were together, we worked hard to make this happen. First, we refined the English translation of the two ordination texts that Ven. Tien Chang had kindly done. This brought up many questions and sparked lively discussions. Fortunately Ven. Tzushin and Ven. Chanlu are expert in Vinaya and could clarify the details. Then we performed the official sangha action (sanghakarma) of “setting the boundary” to delineate the area within which the monastics live. The night before the ordination we rehearsed the ordination ceremonies. This is done so that the person who is receiving ordination will understand exactly what is happening at each step of the process so that she can concentrate during the ceremony. About 12 local friends came for the day of the ordination. First the bhikshunis shaved Jan’s head, except for four small tufts at the top-while everyone gathered around chanting “Homage to our Teacher, Shakyamuni Buddha.” Even Achala, our cat, was fascinated by this and kept his eyes intently focused on Jan. Following this, everyone was invited into the meditation hall where we chanted the incense offering and invited all the Buddhas and Bodhisattvas. The lay people then left the hall and returned to the house where they meditated while the bhikshuni sangha performed the sramanerika and shiksamana ordination ceremonies. Jan knelt down to request to go forth from the “home life” into the “homeless life” of one intent on virtue. Her preceptor (Ven. Chodron) and her instructor (Ven. Chanlu) gave her Dharma advice and shaved off the four tufts of hair on her head. During the sramanerika ceremony, she received her ordination name, Thubten Tarpa. “Thubten” means the “teachings or doctrine of the Buddha” and “Tarpa” means “liberation,” and she received the ten precepts of a sramanerika and began her training in the six Dharmas of a shiksamana. Ven. Tarpa also received her robes and alms bowl. The ordinations were done slowly and very beautifully; all of us were extremely joyous. Afterwards, the guests were invited into the hall and paid their respects. To celebrate they offered a lunch prepared with lots of love. We are grateful to our Dharma sisters Venerables Chanlu, Tzushin, and Tien Chang, for coming to the Abbey so that we could form a sangha to perform the ordinations. We are also grateful to Ven. Jendy who arranged this, even though she was away during the time of the ordination. And we are grateful to all of you who support Sravasti Abbey and its residents so that the Dharma will spread and the monastic sangha will take root in the West.